It’s been an interesting and frustrating few months at Bad Obsession Central. Since episode 11 went up in December, we’ve had Christmas, a cold, a new pair of overalls, the TIG welder packed up, we’ve announced a first unveiling date, the twins turned one year old and we’ve taken delivery of some new stickers. When you think you’ve more or less finished the shell fabrication, it’s not a great idea to have a good look round the car because you soon realise that in fact, there’s a shed load to do. Episode 12 will feature more of the same old stuff we’ve been doing for nearly three years now. However in this latest installment we get to play with some new toys. There’s the TIG welder of course, then there’s another TIG welder as the first one packs up. 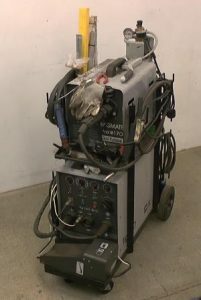 Thanks to you lot, we were able to get hold of a new welder very quickly and the unexpected failure only cost us a day really. We’ll unveil the other new toy during the episode but suffice to say, these days it’s all the rage.